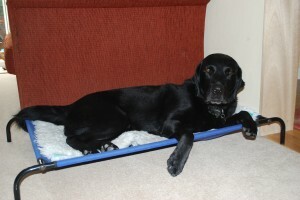 Charlie on a raised bed with vetbedding for padding. Some of the following will happen over a period of time. In very general terms medically a dog over the age of 7yrs old is deemed to be a geriatric. The changes are subtle and will not happen by sheer virtue of the dog becoming 7 years old but will be down to the overall health of a dog too. Having an elderly dog is taking on the responsibility of the above possibilities. A lot of these problems can easily be managed with the appropriate care. The most important element of care is diet. Other factors such as exercise, bedding needs and checking your dogs teeth, all come into the care of your dog which will need to be tailored for your elderly dog as the problem arises. Giving an older dog a good diet, designed with their needs will help prolong their life, thus giving them quality of life at the same time. The diet should consider factors by either preventing the development or the progression of a disease whilst maintaining the animals optimum bodyweight. Food should be highly digestible (good quality without additives). To keep physical activity at a maximum output for the dogs age range will help to maintain muscle tone and the appropriate bodyweight, which will also then reduce the waste matter. (if fed appropriately – over feeding will result in more faeces and the nutrients being expelled in other ways). If there are any known diseases – such as kidney failure or calculi in the bladder then specialist diets can be given via advice from the veterinary surgeon. Elderly dogs do not need a high calorie diet. It is not appropriate to simply reduce the intake of food as this will also be reducing the protein and nutrition. An elderly dog requires a diet which is highly palatable, easily digested, low in protein and low in sodium, increased in essential fatty acids, zinc and also vitamins A, B and E. It is better to feed smaller meals regularly so as to aid the digestive process, consider perhaps feeding three times daily instead of only twice. Moist meals although will encourage better appetite can hinder good dental health so if fed solely on tinned meat then dental hygiene will become more important. However it needs to be noted if the diet is only biscuit/kibble there may come a time when the elderly dog cannot tolerate only dried food as he may be experiencing pain from his teeth when crunching the biscuit. These factors need to be remembered and the diet adjusted as required. There are foods available for older dogs which can be considered if your dog is unable to digest his normal diet or unable to physically eat due to dental issues. Older dogs can become anorexic. If you find yourself in the position of having to encourage your dog to eat, then offer highly palatable foods that smell nice. It is ideal to serve food warm so the smells then waft up the dogs nose. Only ever offer very small quantities to an animal that is off its food. Nutriplus gel is an ideal supplement that can be kept in your doggy first aid cupboard. It is high in nutrition and is a tasty gel that the vast majority of dogs will simply eat. A dog with a poor appetite is more likely to at least lick the gel from your finger or off its legs (most animals like to remain clean, it is a good tip to try as they will clean themselves if they have the energy to do so). An overweight elderly dog will be putting unnecessary strain on his joints, vital organs such as his heart, kidneys and liver. Loss of weight can be caused by something more significant such as kidney or liver failure and some cancers will also cause dramatic weight loss. NEVER restrict water intake. If your dog is drinking to excess there will be a medical reason for this which needs investigating by your vet. Tolerance to exercise may be reduced due to lower general fitness but also could be due to bone and joint problems, stiffness being caused by arthritis. It is important to not stop exercise altogether as a dogs general fitness is what will help keep everything working (internally) as efficiently as possible. The muscle tone on an elderly dog is what will help hold the dog together if he or she is suffering with pain in the joints. You can give your dog remedies for arthritis but you need to make informed decisions and combine it with advise from your vet. An obvious thing to discuss with your vet is giving glucosamine and chondroitin, cod liver oil, omega 3 capsules as a starting point. Some vets are happy to recommend green lipped mussel tablets which are anti-inflammatory. You can discuss how much to give of any remedy with your vet. Noting cod liver oil is high in vitamin A and therefore should be given under guidance (the size capsule in mg in relation to size of the dog). As older animals do not tend to move around as much as an active young dog it is important to consider its bedding needs. If your older dog suffers with incontinence you need to be able to manage this so your dog is kept comfortable and life is kept as simple as possible for you to deal with. “Vet bed” is the best type of blanket for an elderly dog. It provides warmth, the appropriate padding the dog needs and also prevents the dog from sitting in its own urine as the urine will soak through and be held underneath the top layer. A raised bed is also useful to keep the animal free from drafts. Consideration also needs to be made to the dogs ability to get into a raised bed. (only needs to be a few inches from the ground). Your dog should be used to you examining his mouth. You can brush your dog’s teeth to help prevent plaque build-up. The best way to introduce tooth brushing, is to rub the special dog toothpaste in the dogs mouth using your finger. Then apply the toothpaste to a little toothbrush (the ones that sit on your finger like a little cap). Teeth should be cleaned at least once a week. Tartar can build up in the mouth very easily and does need to be assessed by a vet, usually during its yearly check up is sufficient. However a dental on an elderly dog needs to be weighed up against the risk associated with an anaesthetic. Whilst cleaning your dogs teeth, check for bad breath. If you should notice your dog has bad breath in can be down to various contributory factors, like it may require a dental to clean up its teeth, it may have a molar abscess for example. Bad breath can also be down to diet. The more worrying cause of bad breath can be down to diseased or necrotic tissue in the respiratory tract or upper gastrointestinal tracts. In addition some metabolic diseases may produce a distinctive smell (usually likened to pear drops) which can be down to ketoacidosis, Uraemia. Carefully grooming the dog at least once a week (more frequently in long haired breeds) to ensure the dog is free from wounds, lumps and bumps, ticks or parasite infestations. If necessary back combing the hair will help reveal any skin conditions or wounds. The health of the coat will give a very good indication to the health of the dog. Shiny and glossy. Free from dandruff will indicate the diet is appropriate for the dog and the dog is also still metabolising that diet adequately. It will also help reveal if your dog is becoming dehydrated. (a greasy coat which is sticky is a sign of dehydration). Regularly monitor the colour of the gums for general health. They should be a nice pink colour and should feel moist. White gums – a sign of losing blood internally or the animal is in shock. Dirty coloured gums are a sign of poor health as it shows the circulation is not working to full capacity. Any colour other than pink cannot be ignored and further advise should always be sought. Signs of excessive drinking can indicate health problems such as kidney failure. So it is helpful to have an idea of what your dog should be drinking so you then know if he or she is drinking too much or not enough. Regularly check your dog’s eyes for any discharges, look for foreign bodies (such as a grass seed) which will cause irritation. Also checking inside the ear for excess wax which can be down to ear mites. Observations should continuously be made, in effort to always be making an overall assessment of the health of an elderly dog. Every observation helps build a picture of the health. Symptoms on their own may not be a worry but when added together with other symptoms such as weight loss or anxiety, pacing, restlessness these then builds a history from which a vet can base his diagnosis on. Older dogs can become unsettled in strange surroundings due to varying factors such as senility, deafness or visual impairment. The ageing process is affected by any injuries the dog may have sustained which can result in a lower functioning reserve. The organs of the body becoming less able to deal with the extra demands in healing- ie soft tissue repair, or metabolising nutrition and being able to efficiently remove waste materials (faecal matter or urine). It will take longer for an older patient to recover from minor injuries than it would in a younger dog. Can be more accurately described as the patient losing bladder muscle or sphincter tone which will mean that an elderly dog is unable to hold on for long periods of time without being given the opportunity to urinate. Urine and faeces output should be observed. Symptoms of poor health can be noted by darker coloured urine, poor faecal output (ie how firm the faeces is, if mucousy or dark in colour can be down to blood in the stools). Dogs adapt very well to losing sight (or indeed their hearing) as their other senses come into play far stronger to compensate. The main thing is DON’T change the layout of a room as they will be getting around by memory mainly. You may notice your older dog appears to be slightly stubborn at coming back to you when called, and perhaps woofs a little bit more (as though to keep himself company) this can be down the fact his level of hearing is reduced. If you need to attract your dog’s attention then you may need to consider hand signal commands or using a brightly coloured toy to attract his attention. Deafness does not need to have an impact on the quality of life. Animals can suffer from urine scald. There is no excuse for an animal to suffer from urine scald. If your dog becomes soaked in urine this should be cleansed with a mild soapy water and dried properly. Urine scald can initially cause reddening of the skin, once cleaned a barrier cream can be applied to prevent further scalding. It is also important to ensure your elderly dog doesn’t suffer from decubital ulcers, which can result from poorly padded bedding and lack of movement from the animal. The pressure points – being the bony prominent areas are the most likely to suffer. If an animal is recumbent for too long a length of time he should be encouraged to move. Massage can help encourage movement and circulation. If a decubital ulcer is found then keep the area clean and free from hair. Clip away the hair and cleanse the area using something like chlorhexidine, rinsing & drying thoroughly. Apply a barrier cream (dermisol or baby barrier cream, zinc based). A decubital ulcer could need protection with a dressing to prevent the possibility of flies laying eggs in the wound. It must be noted that not all elderly dogs suffer with the above listed conditions but will slow up with old age but will seem healthy throughout their life. Owning an elderly dog can still be fulfilling. Enjoying each others company, being sociable with one another is still enriching for both the dog and the owner. An old dog may not want to be bothered to play, but he will still enjoy being fussed and loved, in particular sharing your company. You owe it to your dog to give him what he needs which fundamentally is an appropriate diet, a good warm padded bed, moderate exercise (to his needs) but regularly given the opportunity to go outside for the toilet and most important of all is to give him love. I am a firm believer in making regular assessments of my dogs without them knowing I am doing it. This is done with regular hands on, cuddles. While they are getting plenty of cuddles I am checking them all over for any abnormalities and checking their chest for fat coverage etc. Feeling their coat is nice and glossy rather than sticky or greasy. In short – all they really need is love. The care they receive combined in “loving your pet” is made with you, their owner being informed in their health needs. If your dog needs help whilst out on a walk, please click here to see a lead I have designed.